You don’t have to memorize it because WE HAVE! We can tell you that understanding water chemistry in swimming pools is no small feat. The amazing part is how much there really is to know! When most people think of pools, they think of chlorine. Stick a few tablets in and you’re all set. Right? WRONG. Gazing at that clear blue water doesn’t start you thinking about the Total Alkalinity, the pH, the Calcium Hardness, the Cyanuric Acid, any possible minerals in the water and how that might affect it or how chlorine works. You just want to jump in! Luckily, we are thinking of all those things when we look at your pool. Of course, we are very happy to educate you on the real facts (and there are a lot!) or, if you’re like many, you don’t really want to know the exact details, just what you need to do plain and simple. Either way, we’re here to help. The key to perfect water quality is proper water chemistry, preventative maintenance and good filtration. Chemistry maintenance plans have a lot of variables so don’t be surprised if we ask you a lot of questions until we get to know you and your pool. We like to get a full understanding of the pool we’re dealing with. We find they each have their own personalities, if you will! Your water quality and amount of maintenance is going to be dependent upon your pool equipment, location of your pool, amount of trees, amount of sun, amount of children and daily use, your water source, your interior pool finish, and other variables. If we put you on a plan and it’s not working for some reason, you have to let us know so we can modify it. Maybe you didn’t tell us you had the soccer team over every Tuesday or maybe yours is the community pool, maybe we didn’t know you were filling from a well with water containing high iron, or that you had a thirty year old filter. We need to know these things. The more we know, the better we can adapt the right plan for YOU. If your water chemistry is off then your sanitizer will not perform effectively, your eyes may burn, your skin may itch, you could burn through excess chlorine, your pool finish could fade or etch, your heater may rot, you could develop scale on your equipment or algae in your pool…nothing nice. Preventative maintenance will keep your pool from getting slippery or green, developing unnecessary stains, and will help prolong the life of your chlorine generator cell and other equipment…making life easier for you. Good filtration will remove any floating particles in your water such as dust, airborne debris, or any floating particulate. If your system is lacking any of the three or you find any of your equipment not up to par, please ask us for your options. We offer free, professional water analysis. The perfect water chemistry starts with the test itself! Bring your water sample in anytime during store hours or drop off a sample in our drop-box located outside our front door. We’re happy to test your water and provide you with personalized printed results. Our testing takes longer than in other stores but we’re very picky about the quality of our results. We want it just right! If that takes more time, we apologize. We also know, it takes us a while to go over each test result with each customer. We could simply hand you the print out and say “have a nice day” but, fortunately for you, WE are smarter than the computer so we feel the need to make sure you are properly instructed. For that reason, we will gladly number your instructions in the order they should be performed and add any special instructions we feel would speed up your results. Yes, it takes a while to get through the line but when it’s your turn, you will be well compensated for the wait with friendly, knowledgeable service. We appreciate your business and your time very much and thank you for choosing Family Pools. When a quicker method comes around that meets our high standards, we will surely make the change. Until then…it’s not broken. Sanitizers alone don’t cut it for water chemistry. If, for instance, your pH is off balance, your chlorine won’t kill effectively leaving your pool insufficiently sanitized. Low pH will also cause corrosion to equipment and eye burn. For this reason, we need Balancing Chemicals. When your pool is out of balance, it can remain clear or become slightly cloudy. It is impossible to tell if your pool is out of balance without testing so we recommend that you use a good quality test kit or have your water checked in our store routinely. We recommend that you bring in a sample once per month or at the beginning, middle, and end of the season at the very least. Check it yourself in between with test strips or a drop test kit. We can’t stress enough how important it is to keep your pool balanced. Balancing chemicals do not kill or prevent algae or remove stains. For this reason, we need Maintenance Chemicals and sometimes Specialty Chemicals. Maintenance chemicals are chemicals we use on a routine basis to maintain our pool quality and appearance. We use Shock Treatments to oxidize out combined chlorine and contaminants in the water. We use Algaecides to prevent algae. The dentist tells you to use dental floss. The doctor tells you to take vitamins. The fitness trainer tells you to exercise. All good things need maintenance! As you know, your pool needs a sanitizer to keep it bacteria free. What you maybe had not thought of is that the sanitizer you are using is getting used up on a regular basis as the sun beats on it and as contaminants enter the pool through the air, the rain, from people swimming, from Fido jumping in, and so on. You don’t know how fast it’s getting used up. If there are lots of swimmers, lots of rain, or lots of sun, it’s getting used up faster, rates vary. The ideal range for chlorine as a sanitizer, for instance is 1.0 to 3.0 ppm. 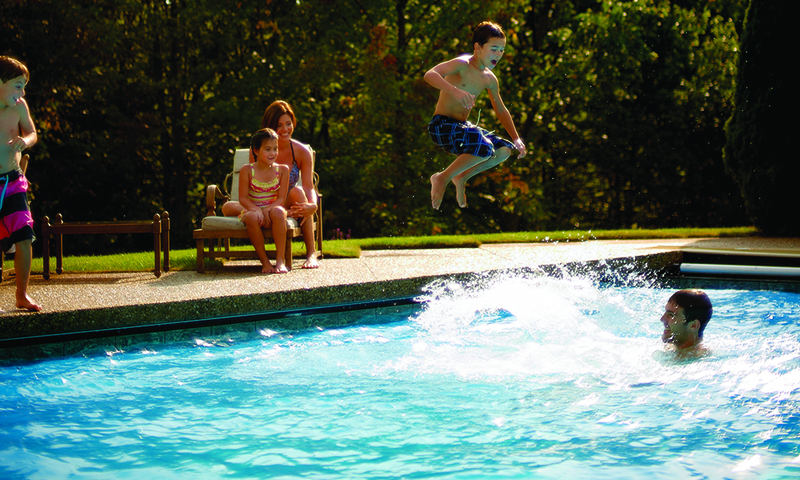 If your chlorine level drops below 1.0 ppm at any time then your pool is susceptible to algae. For this reason, we recommend using an Algaecide. Consider it insurance! When, or if, your chlorine should drop below 1.0 from the time you put it in your pool until the next time you put it in, your pool will be insured against algae if it’s properly protected. This goes for any sanitizer you may be using…it gets used up. The other factors are how active your sanitizer remains, how many germs and bacteria your sanitizer kills, and how those contaminants oxidize out of your pool. There are two forms of chlorine…Free Chlorine and Combined Chlorine. This is pretty easy to remember. Picture it. 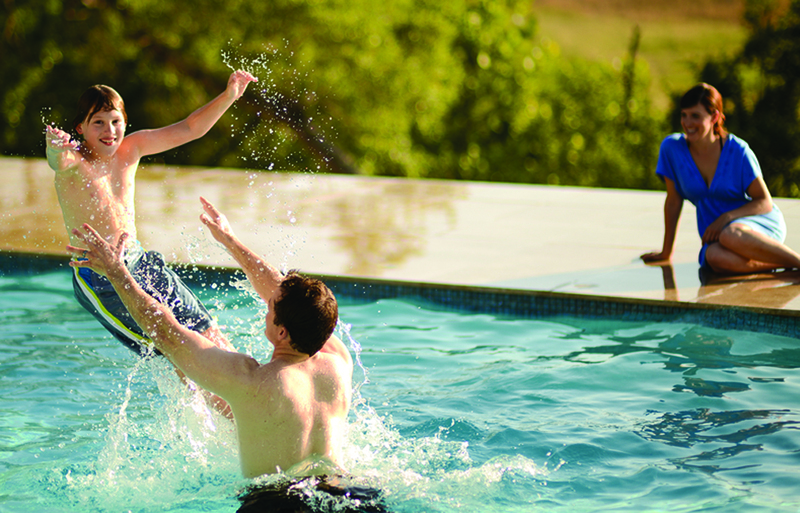 When you put chlorine in your pool, it enters the water free and active, available to kill any bacteria or contaminants. Can you picture it, actively going around your pool fighting off bacteria? Karate chop here, karate chop there. Once it meets up with the bacteria or contaminant, it combines with it. The molecules combine as it makes the kill. What happens then? Well, you now have, possibly, some Free Chlorine in your water still active and available to ward off bacteria and you have some Combined Chlorine in your water. The Combined Chlorine is no longer useful, done its job, worn out, dead. What happens when something dies…it stinks, right? Did you ever smell that stale chlorine smell in anyone’s pool? That’s right…Combined Chlorine. Free Chlorine has no smell. Combined Chlorine is to blame when a pool smells like chlorine and it’s also responsible for making blondes green, making eyes burn, skin itch, and all the ill affects you hear about from chlorine. This is why we need to add Shock Treatment to our pools routinely. We already said we don’t know how fast our chlorine is getting used up so it’s best just to add Shock Treatment routinely every week or two weeks to oxidize out any contaminants and Combined Chlorine and leave our pools smelling good and feeling comfortable to swim in. You’ll smile with that bright smile when you see that clear water, you’ll be energized to jump in that pool after taking those vitamins, and you’ll be in great shape after doing all those laps. 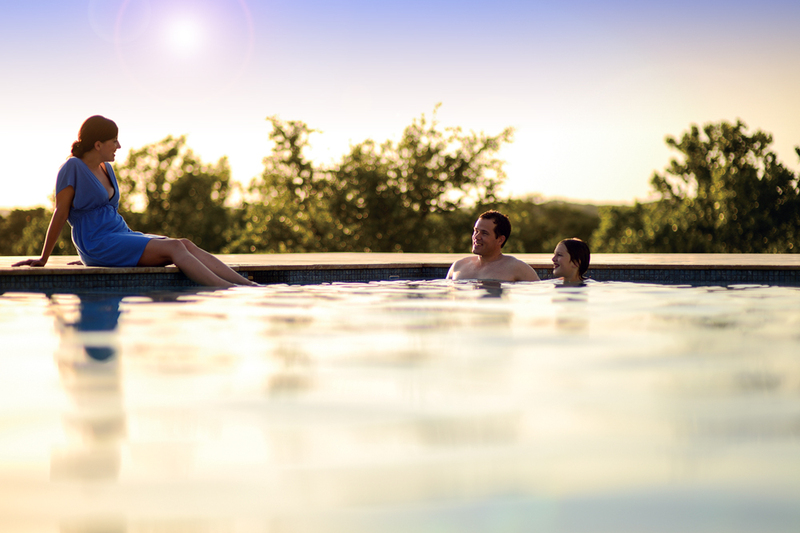 Who knew your pool could be such a great part of your overall health, well-being, and fitness?! Keep yourself healthy, keep your pool healthy, follow a good program! For help in choosing the right Maintenance products for your pool, please speak with one of our retail associates when you bring your water in for an analysis. It’s important to choose the right products compatible with your pool surface and sanitizer. Lastly, we have Specialty Chemicals and we hope none of you ever need these or don’t need many anyway. I suppose a bottle of Ring Leader couldn’t hurt anyone. Unfortunately, we all get that bathtub ring around our pool. If you let it set on there, it will bake in with the sun and be harder to remove. It’s best to tackle it when you see it. Keep a bottle of Ring Leader or some Miracle Pads close by…but don’t use them together, one or the other, both work great. In fact, I use Ring Leader in my bathroom, my kitchen, on my boat, it makes a great all purpose cleaner. Other Specialty chemicals are used for cloudiness, stain removal, mineral removal, prevention of mineral problems, phosphate removal, and settling fine particles that won’t settle. Stains can be organic or mineral in nature. The key to stain removal is figuring out which it is then you know how to attack it. Here’s a tip ~ acids remove mineral stains. If you have a stain you aren’t sure of, try acid on it. If it removes the stain, the stain is mineral in nature and you can proceed from there. If not, the stain is most likely organic and chlorines and algaecides usually tackle those best. Our Retail staff would be happy to guide you in the right direction if the problem should occur. Cloudiness…there’s a tricky one! Could just be a low sanitizer issue and a good Shock Treatment could snap it right back into shape. Could be all that pollen that messes up our cars, messes up our houses, and anything in its path that it lands on. Could be improper water balance. Could be a broken filter component allowing filter media through into your pool. The best course of action would be to test the water to make sure nothing is out of balance. Adjust it, of course, if there is something. Shock the pool if the sanitizer is low or the combined chlorine is high. Check your filter to make sure nothing is broken. If you’re not sure what to check, make you inquire with us and we’ll be glad to help. If all else fails, ask us about what Specialty products we may have to help you through your situation. It’s important to choose the right products so you don’t clog up your filter unnecessarily or choose a product that is not compatible with the chemicals you are presently using, your pool surface, or your filtration equipment. Choices, choices, choices, the pool industry is full of them! Balance your pool properly. Then, use a Sanitizer followed by a good Shock Treatment and Algaecide for proper maintenance & healthy water chemistry. Tip – When opening your pool, particularly if it’s green or discolored, Shock it heavily, vacuum to waste if possible, then balance and proceed. The balancing chemicals are necessary for bathing comfort and to protect equipment and pool surfaces, they will not clear the pool. Filtration, Shock, and Algaecides will clear the pool. Let us know if you are having trouble so we can guide you in the right direction. Don’t wait until your bald, in a straight jacket, and summer is over to let us know if you are having difficulty. Our aim is to keep you swimming! *Special note: If we’ve summerized your pool then we’ve taken a water sample. When you come into the store for your results, simply go to the front of the line and ask us to print your results. They will be ready and in the computer. Please welcome back Jasmine, our third shift water tester, who is responsible for having your tests ready and waiting the day after your opening. Another little way we try to speed up our results.